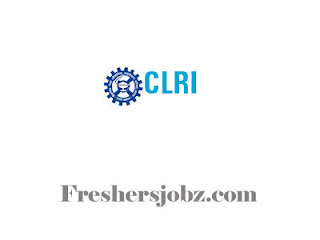 CSIR-CLRI Notification 2018.Central Leather Research Institute CLRI has released a notification for the recruitment of Trade Apprentice in fitter, welder, plumber, carpenter etc trades.Check the eligiblity and notification prior to apply for the positions. B.E/ B.Tech (Civil Engineering/ Chemical Engineering/ Environmental Engineering/ Energy & Environment/ Biotechnology) with at least 60% marks from recognised University/ Institute plus 02 years of post-qualification research experience. M.Sc (Chemistry/ Inorganic Chemistry/ Physical Chemistry/ Organic Chemistry/ Analytical Chemistry) from recognised University/ Institute plus UGC-CSIR NET/ NET-Lectureship/ GATE qualification. B.E/ B.Tech/ B.Des (Mechanical/ Leather/ Production/ Textile/ Leather Design/ Accessories Design) with minimum 55% marks from recognised University/ Institute. B.Tech (Pharmaceutical Technology) with mm1mum 55% marks from recognized University/ Institute. Level-I: Diploma (Leather Technology) with mm1mum 55% marks from recognized University/ Institute. Level-II: B.E (Biomedical Engineering/ Mechanical Engineering) with minimum 55% marks from recognized University/ Institute. B.Sc (Chemistry/ Physics) with minimum 55% marks from recognized University/ Institute. M.Sc (Chemistry)/ B.Tech (Leather Technology) with minimum 55% marks from recognized University/ Institute. B.E/ B.Tech (Nanoscience and Nanotechnology)/ M.Sc (Chemistry) with minimum 55% marks from recognised University/ Institute. (Position) : B.E/ B.Tech (Chemical Engineering) with minimum 55% marks from recognized University/ Institute. (Position2): M.Sc (Chemistry)/ B.Tech (Biotechnology) with minimum 55% marks from recognised University/ Institute. B.Tech (Chemical Engineering/ Biotechnology/ Instrumentation) with minimum 55% marks from recognised University/ Institute. M.Sc (Chemistry) with minimum 55% marks from recognized University/ Institute. M.Sc (Microbiology)/ B.E/ B.Tech (Biotechnology) with minimum 55% marks from recognised University/ Institute. Level- I: Diploma (Leather Technology) with minimum 55% marks from recognized University/ Institute. Level- II: B.E/ B.Tech (Leather Technology) with minimum 55% marks from recognized University/ Institute. ME (Environmental Engineering/ Environmental Management) with a Bachelor Degree in Civil Engineering with minimum 55% marks from recognized University/ Institute. B.Tech (Civil Engineering) with minimum 55% marks from recognized University/ Institute. Diploma (Electrical/ Electronics & Communication/ Instrumentation) with minimum 55% marks from recognised University/ Institute. Interested and eligible candidates may attend the Walk-in interview at below venue along with Application Form which is available at official website clri.org on 24.10.2018. Contenders who are attending for Walk-in-interview needs to bring Original Certificates along with Xerox Copies.